Antonio Conte gestures on the touchline during his time as Chelsea head coach. The Italian, who spent just two years with the Blues, was widely reported to be facing the sack for much of last season after the breakdown in his relationship with Chelsea owner Roman Abramovich and the club's hierarchy. But Conte was made to wait 55 days after Chelsea's FA Cup final win over Manchester United before he was axed. Conte is believed to have received a £9 million (AU$16 million) pay-off for the year he had remaining on his Chelsea contract, yet the Times reports the former Juventus coach is keen to get additional compensation. 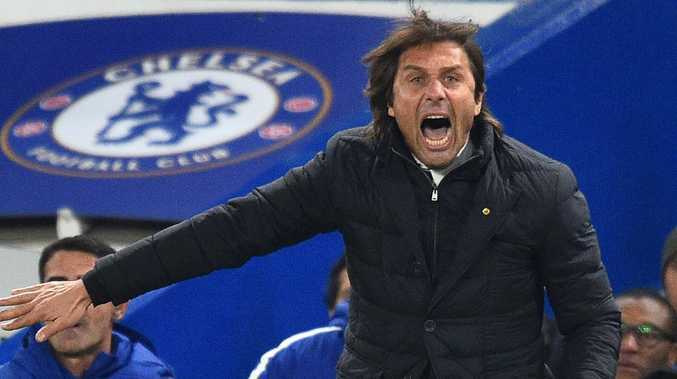 That could trigger an ugly legal battle, with Conte's lawyers reportedly set to claim the west London club cost their client a year of his career, as all the top management jobs in Europe have been filled. The Times also reported Chelsea have threatened to withhold Conte's contract settlement due to repeated criticism of his employers over their failure to back his transfer demands.